May 16 was the 100th birthday of the inspiring writer-oral historian Studs Terkel. The “Mediterranean Everyday History Society” remembered some of the key works of this great writer and the path he has shown millions all over the world. 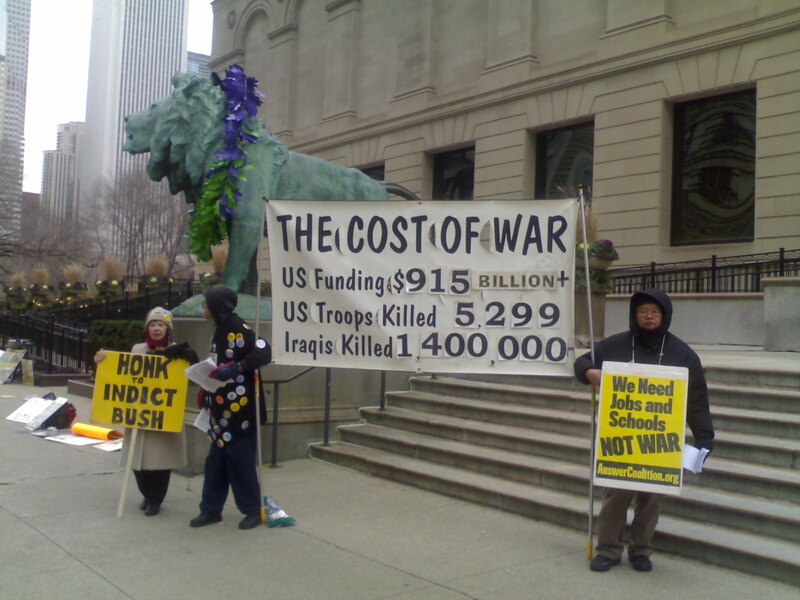 Anti-war protestors in front of the Art Institute of Chicago, December 2009, near Millenium Park Chicago. The Millennium park of Chicago was the place where Studs Terkel made one of his last public appearances on Labor Day.. In his autobiography “Touch and Go” he tells of the Evil of Banality and defines himself as a Radical Conservative. 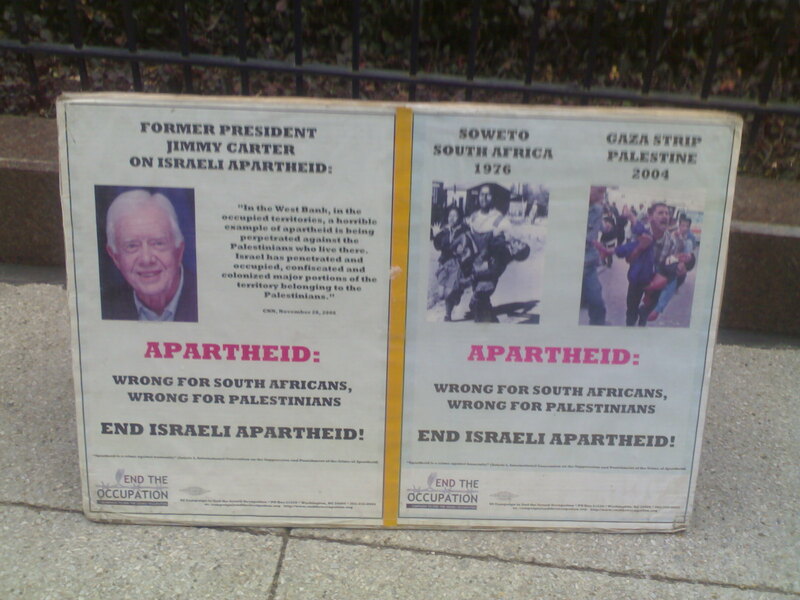 Anti-Apartheid protestors –December 2009, Michigan Avenue, Chicago. These are the streets where the writer –Oral historian Studs Terkel once walked and gave courage to ordinary working people. His legacy lives on. Active reading involves reading out and then asking for key points, interpretations and applications in daily life. My eightfold Prakriti (Nature) comprises Earth, Water, Fire, Air, Ether, (typifying solid state, liquid state, energy, gaseous state, and Space respectively), Mind (thinking faculty), Intellect (determining faculty) and Ego (distinguishing faculty). The remaining three constituents are subtler- the Mind, the Intellect, and the Ego. The Mind is always active in contemplation of one thing or the other. It is governed by the Ego., which signifies the faculty of differentiation. In its degenerate forms, Ego denotes pride, haughtiness, vanity, arrogance or conceit. At the root of all these qualities lies a feeling of being different from and superior to others, which is an essential feature of Ego. The Intellect , which signifies the faculty of determination between several alternatives, is superior to the Ego. The Intellect has the extraordinary power to reflect Divinity. When illumined by Divinity, the Intellect manifests the power of discriminating the Real and Unreal. While not being against joint prayer, the degeneration of these into friendship clubs of gossip and other forms was underlined. If there is focused interpretation of texts and their applications in daily life, it is a welcome move. If it is a platform for gossip and negativism, and even vulgar comments, then it is a degeneration. Following the theme of creating an “anthropology of ourselves” we observe how expatriate workers deal with different issues at work and play. Food culture, the way they sing their hymns, the energy of the African choir with the crowd joining in at an energy level which I have never experienced came through. There is a difference between the energy of the Indian choir or the Filipino choir and the African choir. “The word “Liberal” today has replaced the word “communist” as used in the high-flying days of Tailgunner Joe. When John Kerry, the Democratic candidate for President, Vietnam War hero, defends himself, “I am not a liberal,” as though to be a liberal were shameful, less than American, we are deeper than Alice ever was in Wonderland. of individuals to act or express themselves in a manner of their own choosing. Through work, management issues in corporate set-ups as they evolve in Libya or the themes of Mass observation and reading groups or interviews with persons who have been in the prisons of former dictator Gaddafi, we explored the meanings of “Radical Conservative” as Studs Terkel defined himself. This entry was posted in Arab Spring-Libya, Diary, Learning, life and tagged Diary, Gita Reading Groups, Hay Market, Labour Movement, Libya, Studs Terkel, Tripoli, Tripoli Reading Group. Bookmark the permalink. Yes, Studs Terkel had a very long view of things, one can learn from him in every part of the world.